On Saturday evening, January the 19th, 1833, I was summoned to attend William Mills, aged 10, living at Boughton, two miles from Upton. When I arrived, his parents informed me that their son had shot himself, with a gun made out of the handle of a telescope toasting-fork. An unusual way to greet a doctor. If I were trying to make myself a gun I doubt it would occur to me to employ a toasting fork as a major component. To form the breach of the gun, he had driven a plug of wood, about three inches in length, into the handle of the fork. The touch-hole of the gun was made after the charge of powder had been deposited in the hollow part of the handle. The consequence was that, when the gunpowder exploded, it forced the artificial breach, or piece of stick, from the barrel part of the gun, with such violence, that it entered the thorax of the boy, on the right side, between the third and fourth ribs, and disappeared. Immediately after the accident, the boy walked home, a distance of about forty yards. The fact that he was still able to walk appeared a good sign; and when the doctor examined the boy the case did not immediately seem a serious one. By the time I saw him, he had lost a considerable quantity of blood, and appeared very faint; when I turned him on his right side, a stream of venous blood issued from the orifice, through which the stick entered the thorax. Several hours elapsed before any degree of reaction took place. He complained of no pain. Indeed, for the next couple of weeks he seemed to be little affected by the accident. For the first ten days or a fortnight after the accident, he appeared to be recovering, and once, during that time, walked into his garden, and back, a distance of about eighty yards; and whilst there, he amused himself with his flowers, and even stirred the mould. Hobbies: horticulture and firearms. A slightly odd combination for a ten-year-old. He always said he was well, and was often cheerful, and even merry. There was no peculiar expression of countenance, excepting that his eyes were rather too bright. An unusual medical observation, and one which I suspect is seldom made today. After the first fortnight he visibly emaciated, and had frequent rigors, which were always followed by faintness. The pulse was very quick. There was no cough nor spitting of blood. The secretions were healthy. He had no pain throughout his illness. He died on the evening of the 25th of February, exactly five weeks and two days after the accident occurred. On opening the thorax, a small cicatrix [scar] was visible between the cartilages of the third and fourth ribs, on the right side, about half an inch from the sternum. The lungs appeared quite healthy, excepting that there was a small tubercle [nodule] in the right lung, and at its root, near to the pulmonary artery, a small blue mark in the cellular tissue, corresponding, in size, with the cicatrix on the parietes of the chest. All this is consistent with a wound caused by the piece of wood, which had apparently passed through the chest between two ribs and entered the right lung. But then they had a surprise. The heart, externally, appeared healthy. 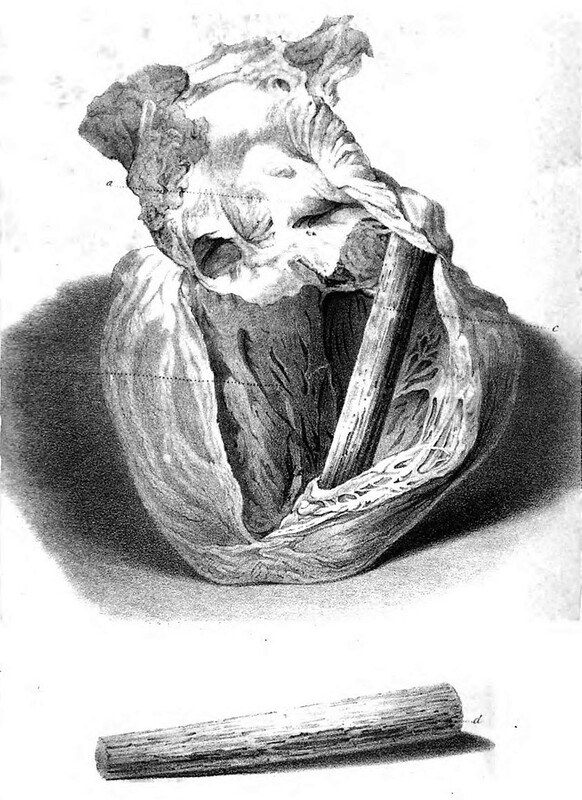 When an incision was made into the heart, so as to expose the right auricle and ventricle, we were astonished to find, lodged in that ventricle, the stick which the boy had used as the breach of the gun, the one end of it pressing against the extreme part of the ventricle, near the apex of the heart, and forcing itself between the columnae carnea and the internal surface of the heart; the other end resting upon the auriculo-ventricular valve, and tearing part of its delicate structure, and being itself encrusted with a thick coagulum, as large as a walnut. To clarify: the stick had lodged in the right side of the heart, the side which propels deoxygenated blood towards the lungs. The right auricle (known today as the right atrium) is the chamber through which blood enters the heart, before passing through the tricuspid valve (previously the auriculo-ventricular valve) into the pumping chamber of the right ventricle. The columnae carneae (from the Latin, literally ‘meaty ridges’) are a series of muscular columns which project into the ventricle. The stick had somehow become wedged underneath them; a large clot had formed around it – as one would expect when a foreign body spends any length of time in the bloodstream. We searched, in vain, for any wound, either in the heart itself, or in the pericardium, by which the stick could have found its way into the ventricle. Highly significant. If the stick had simply pierced the wall of the heart, two things are likely to have happened. Firstly, the boy would almost certainly have died within minutes. A wound big enough to admit such a large object would have caused catastrophic bleeding. Secondly, in the unlikely event that he had survived, it would have left a significant scar on the heart muscle. This case strikes me as one of the most interesting on record. In the first place, that this child should have survived such an accident, as the lodgement of a stick, three inches in length, in the right ventricle, and have been afterwards equal to so much muscular exertion as he was, appears wonderful, especially if we consider the mechanical difficulty which the heart had thereby to encounter in carrying on the circulation of the blood. Quite. The case is not unique, but it is certainly exceptional. In the next place, it appears somewhat difficult to point out, how the stick found its way into the right ventricle of the heart. There was no wound, nor remnant of a wound, either in the pericardium, or in the muscular structure of the heart. I am inclined, myself, to think, that the stick, after wounding the lung, passed into the vena cava, and was carried by the stream of blood, first into the right auricle, and then into the right ventricle, where it became fixed, in the manner before specified, and as is shewn in the accompanying plate. This was indeed a remarkably interesting case, so we’re lucky that the doctor took the trouble to commission an illustration. Bear in mind that the boy lived for over a month with this stick in situ. I’m glad that William wasn’t in pain for all that time. It’s a shame though, he seemed very inquisitive. I wonder what he could’ve accomplished had he lived.